With the DATRON CleanCut System, chips can be removed very efficiently. Nearly chip-free working is possible thanks to this suctioning technology developed especially for plate machining. 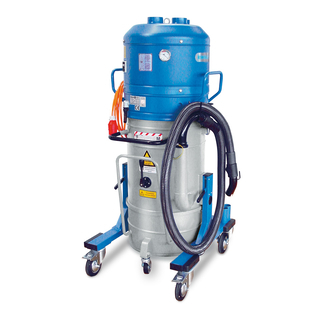 Time-consuming machine cleaning is no longer necessary. Due to non-contact removal of chips, CleanCut suctioning is also suitable for highly sensitive surfaces. 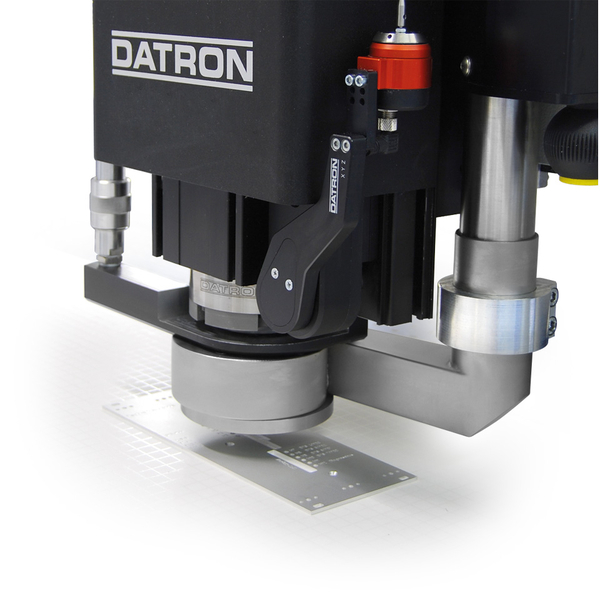 The automatic extension/retraction of the suction head also saves time. Tool measurement and 3D measurement can be performed without any restrictions. If the suction funnel disturbs during machining, it can remain fixed in the retracted position or be dismantled. With the optionally available four-nozzle cooling lubrication head, you can remove chips and effectively cool the machining tool at the same time. 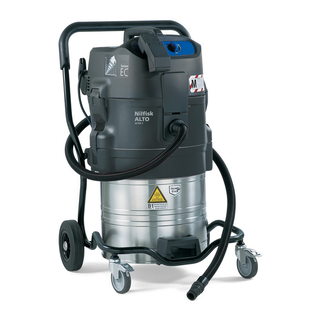 This combination of suction and minimum quantity cooling leaves almost no residue. The RI 331 industrial vacuum cleaner is particularly suitable for use with the DATRON CleanCut suction system. 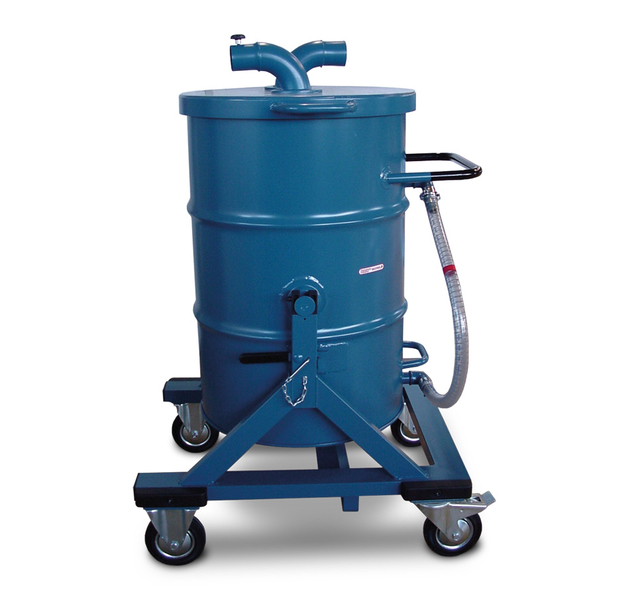 A large volume pre-separator allows the vacuum cleaner to be operated for a long time. The sound-insulated and splash-proof housing is made of painted Steel. The vacuum cleaner is also equipped with a pressure manometer for volume flow monitoring. The pre-separator has a collection vessel volume of 160 litres with a tilting undercarriage which can be tilted by a forklift or a crane. The pre-separator can be rolled with two steering and fixed rollers. 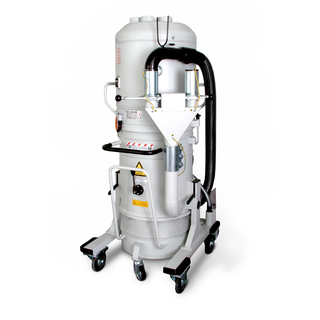 The specially powerful graphite dust suctioning for the machining system M7 offers the greatest possible protection from fine graphite dust for the machine and its surroundings. A round suction nozzle on the machine table encloses the workpiece and the clamping fixture. In connection with the high suction power of the suction unit, there are eddy currents in the nozzle which surround the workpiece and effectively suction any dust created during machining. Larger particles remain in the nozzle and can be vacuumed up with the manual suction nozzle present on the suction unit after machining. In stage one, course particles are separated from the rest of the dust in the "cyclone" and are caught in a 50 l tank. In stage two, graphite dust is separated from the suctioned air in the main filter element. The filter element is cleaned by means of a mechanical device. 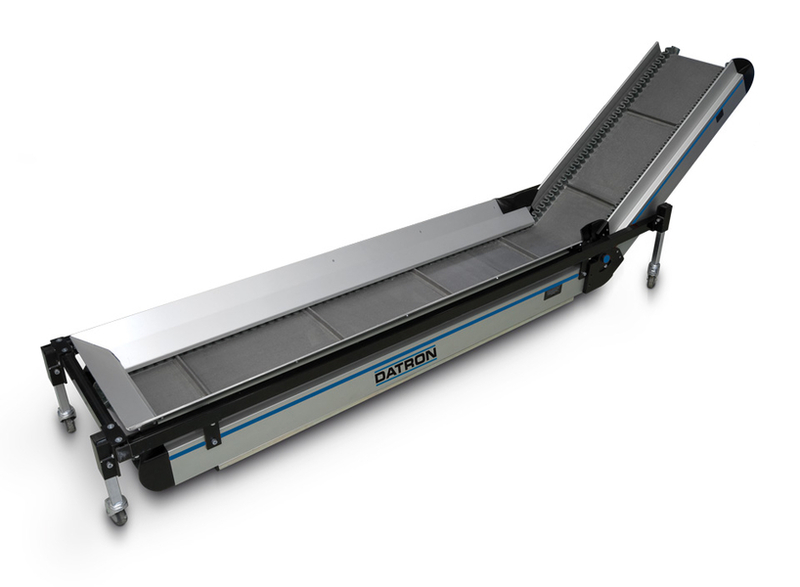 The DATRON suctioning system SAS is used in order to dispose of any accumulated chips and dust which form during sheet-metal machining. 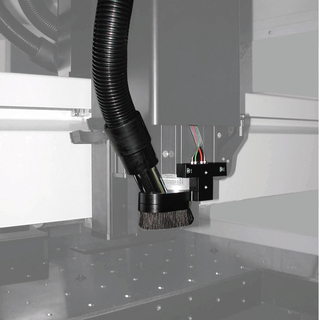 A brush which surrounds the milling cutter keeps chips and dust in the drawing area of the suction. SAS suctioning is suitable for spindles with direct shaft clamping. Security Suction System (complete with accessories) for the removal of dangerous dust (class M). The robust and durable design of the DATRON chip conveyor, made of anodised Aluminium extrusions, allows dry and slightly moist chips to be transported out of the machine. In addition, chips can be conveyed up to 60° upward and are conducted directly away into a container. 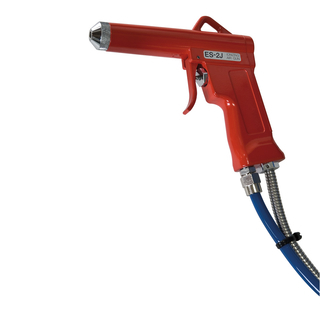 Ionised compressed air is given off with the ion spray gun. This way, electrically charged chips, which adhere to the machine after machining plastics or other materials, are discharged. The chips hit by the ionised air discharge and fall to the floor. This drastically reduces the time for the tedious cleaning of workpieces and machine walls. 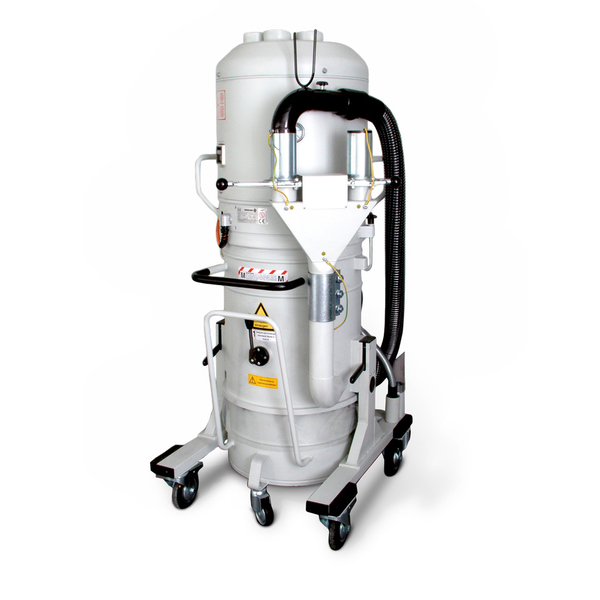 The ion spray gun can be retrofit on any machine. All that is needed is a connection for the compressed air supply and a 230 V electrical socket.